Back in the 80's Ron Gruell and Tom Truax flew a site we named Ron's Ridge. 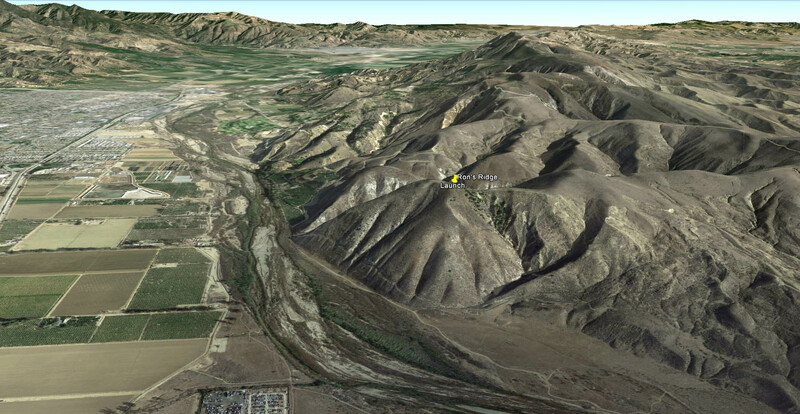 The short ridge is a SW facing protrusion on the river side of South Mountain (see Google Earth KML File]. We would drive up in Ron's jeep, crossing the river through a quarry at the end of Mission Rock Road (no longer there? ), but you might be able to turn left on Shell Road and get close enough to hike up, about a 4 or 5 hundred yard hike to the base of the hill from the west side of the river. It's about the same vertical as the Ventura Avenue Site, about 700 feet above the river, with launch around 900 MSL and the river about a 200 MSL river. You may not need hike all the way up. You might be able to launch lower and bench up. If you have a SUV, you might be able to cross the river? In the 80s would drive up to launch with our HGs, but it was through private property, so I don't know what the gate situation is today. In the summer, the heavy cool marine air channels up the river, but some of it will be forced up and over the protrusion that juts out into the river flow. The flow is pretty laminar, so don't expect to get real high. You might be able to thermal up and away in the winter months, but I think the potential in the summer might be limited to the fish bowl.